Material Function - World Aligned Texture/Normal With offset & Rotation. [ASSETS] Material Function - World Aligned Texture/Normal With offset & Rotation. Someone on our fb group needed a way to rotate a Texture object, while using the regular world aligned texture/normal and that is a hard thing to do.. 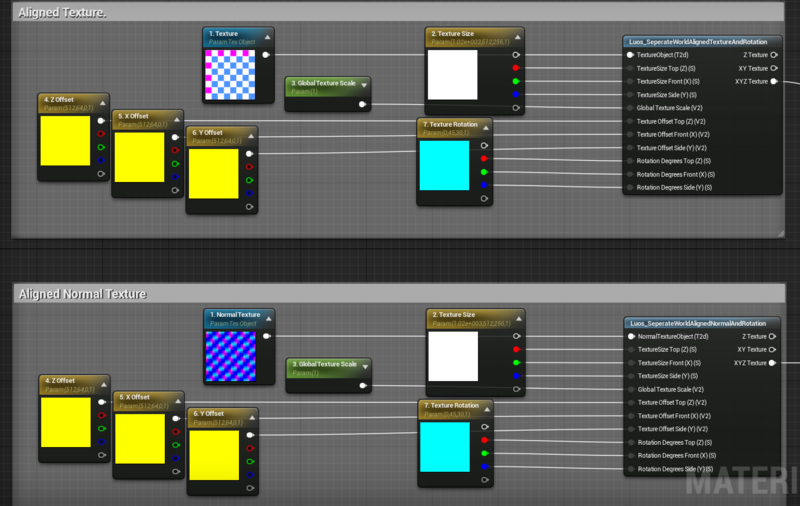 I decided to recreate these two nodes with additional features, and cleaning up/removing a few features (that nobody seem to use). - Added seperate axis rescaling options. - Fixed normal rotation issues. it *should* work properly now. - Made sure the normal version is exposed to the library. - Created a new versions of both the worldAlignedTexture & WorldAlignedNormal where each axis (X, Y, And Z) can separately be scaled, rotated, offset. 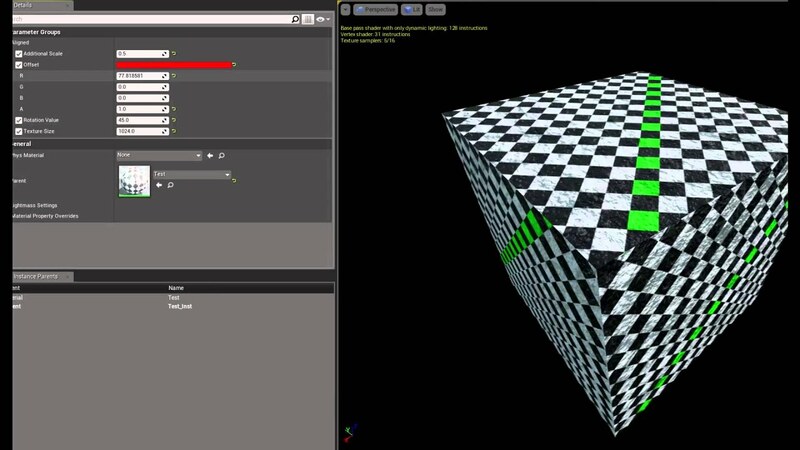 - Added example project with materials & Material instances. Last edited by Luos; 06-13-2017, 03:57 PM. Created a new versions of both the worldAlignedTexture & WorldAlignedNormal where each axis (X, Y, And Z) can seperately be scaled, rotated, offset. This is leagues better than the World Aligned Texture node provided with the engine. Thanks! 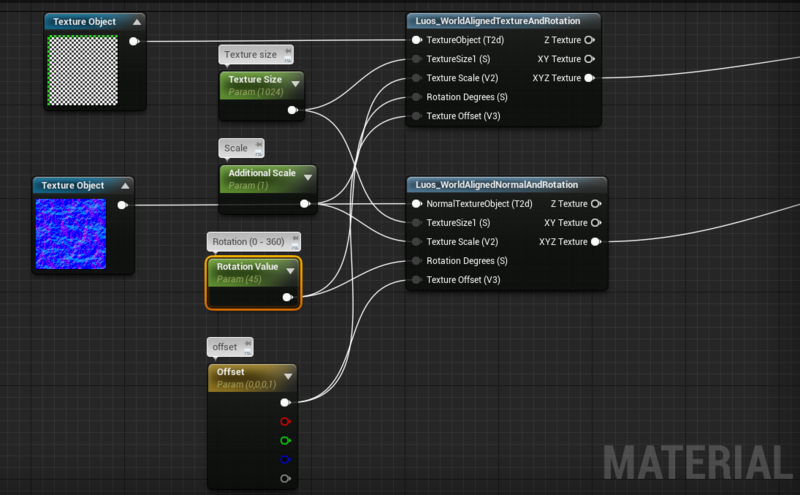 Cool node, that wouble better if rotation,size and offset x/y/z were single vector3 isntead of 3 scalars, to reduce clutter in material editor, so it would have 4-5 inputs instead of 11. I seem to be having some trouble getting the Luos_WorldAlignedNormalAndRotation to work. 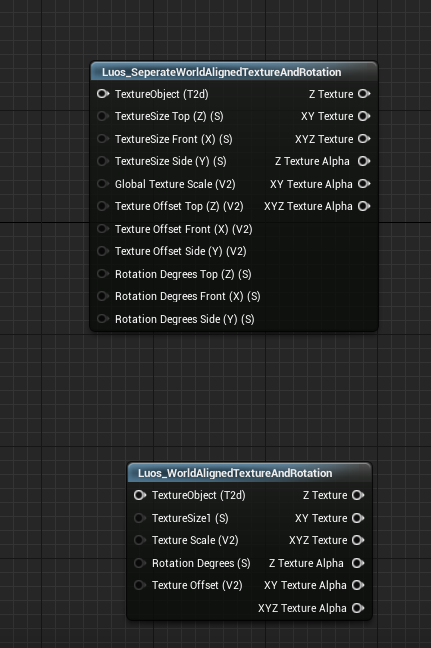 Adding a rotation value does rotate the maps but my normal maps aren't getting their vectors updated. Am I doing something wrong here? Did an engine update break something? Any help would be greatly appreciated. It does sort of work when the mesh and/or the lighting is dynamic, but to actually get this correctly, it would need some weird math/lerp/blending between the normal map's red and green channel.. or was it something with the blue channel. its 1:30 am and brain is fried. Cool, thanks! I will check back later then. Let me know if it works properly now. Also, apologies for the laaaaaate fix, totally forgot about it untill paul posted his comment. How to use ParallaxOcclusion with it? Last edited by brothermechanic; 04-07-2017, 10:29 AM. No clue, never used it. You might need to try it with a heightmap or whatever and see if it works. Can you help me to improve this function?